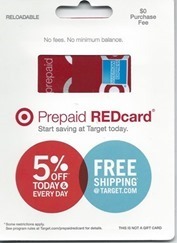 The Target Prepaid REDcard is a reloadable American Express card, very similar to Bluebird and Serve. In fact, it is so similar to Bluebird, that we’ve taken to calling it REDbird. REDbird can be reloaded for free at any Target store and can be used as a credit card anywhere American Express is accepted. At Target, the card offers an automatic 5% discount on all purchases, and free shipping for online orders. And, it offers free bill pay. In addition to all of its great checking-account-alternative features, REDbird offers great opportunities for earning points & miles. For an overview of REDbird, please see: REDbird: The Target Prepaid REDcard. Also, if you’re curious about how REDbird stacks up to its similar brethren, please see: The complete guide to Bluebird, REDcard, Serve, and SoftServe. REDbird temporary cards are not available online. To get one, you have to visit one of the few stores that carry them, or get someone else to do so for you. One option is to buy one from a re-seller such as NoonRadar (www.NoonRadar.com). Once you get your temporary card, you must register it online in order to get a permanent card. Each person can have only one REDbird, Bluebird, or Serve card. Once you have the permanent card, you need to add money to it. The way to earn credit card rewards while adding money to REDbird is as follows: 1) find a way to buy Visa or MasterCard debit gift cards with a credit card (see: Best options for buying Visa and MasterCard gift cards); 2) At Target, reload REDbird and pay by debit card (using the gift cards). Details for reloading REDbird can be found here. Once you have money on REDbird, you can unload that money easily by using REDbird’s no-fee bill pay feature. You can use REDbird to pay bills that can’t normally be paid by credit card. Use it to pay your rent, mortgage, or even your credit card bill! How do I get REDbird? Go to a participating Target store and buy a temporary card. Can I order one online? You can’t order one online from Target or Amex, but some re-sellers do make them available online. One re-seller that has received many positive reviews and has contributed productively to the comments in this blog is NoonRadar (www.NoonRadar.com). How do I find a participating Target store? Check the map here. Also call your local Target store and ask if they carry the Prepaid REDcard. Make sure to stress the “prepaid” part. Activation failed but my credit card was charged. What should I do? Call Amex here: 800 438 6468 (open from 8AM to 6PM MST). What is the process for buying the temporary card? Hand temporary card to cashier; tell them how much you want to load ($1 to $500); hand them your drivers license; key in your phone number, SSN, and birthdate; and pay. Full details here. Is it safe to give this info to Target considering the recent data breaches? I have no idea, but it’s worth the risk to me. How do I know if I got the right card? Make sure it says “Prepaid REDcard” on the package. Don’t signup without a temporary card or you’ll end up with the Target Debit REDcard or the Credit REDcard (those are different). How much does the temporary card cost? Either $0 or $5 depending upon which Target store you go to. Can I buy the temporary card if I have a Bluebird or Serve card? Yes, you can buy it, but you can’t register it online until you close your Bluebird or Serve card. Can I buy the temporary card for others? Yes. Use your own info to buy the card. The recipient of the card can put in their own info when they register the card online. Read this: How to buy REDbird for others, and how to use them at non participating stores. Can I buy more than one temporary card? Yes, but the Target registers will limit you to one per day. It is possible to get around that limit by entering the eventual recipient’s SSN instead of your own. Can you buy one for me? Can a friend to buy one for me? Yes. Tell them to read this: How to buy REDbird for others, and how to use them at non participating stores. Can I reload the temporary card? Yes, but not until you’ve registered it online. Once you register the card online, you can load up to $1500 on the card (inclusive of the initial load). How do I get money off the temporary card? Once the card is activated, it can be used only as a credit card. Once you register it online, you can then withdraw cash at Allpoint ATMs. Is REDbird the same as the American Express for Target card? What will happen to my American Express for Target card if I get REDbird? It will have a new friend in your wallet. Can I convert my American Express for Target card to REDbird? Can I convert my debit or credit REDcard to REDbird? Can I sign up my kid for his/her own REDbird account? Are they 18 or older? If so, yes. If not, you can only setup a subaccount for them. The subaccount has no particular use for earning miles. I already registered the card at Target. Do I have to register online too? Can I register online if I have an open Bluebird or Serve card? Can I register online if I have an open Amex for Target card? Can I register online if I have an open Debit or Credit REDcard? Can I register online with my own credentials even though someone else bought the card for me? Can I register online with my relative’s credentials even though I used my own when I bought the card? Yes (as long as your relative says it is OK with them). What do I do if Amex asks me to send in proof of ID and other documents? Can I register online with a fake SSN? Can I register online with an ITIN or EIN? Registration failed. What should I do? You can try calling the number on the package or use the temporary card to buy a new temporary card and try registering the new one. After registering online, how long does it take to get the permanent card? About a week or two. After registering online, what can I do with the card until the permanent card shows up? You can load more money to the card at Target, up to $1500 inclusive of the initial load. You can also use it as a credit card or withdraw cash at an Allpoint ATM. Should I max out my Bluebird or Serve card early in the month before cancelling and registering REDbird? Can I reload at a Target store that doesn’t sell REDbird? Does Target have an automated kiosk that can be used for reloading? What forms of payment can I use to reload REDbird? Can I reload my Bluebird or Serve card at Target? Find a place to buy Visa or MasterCard gift cards with a low fee and where they will allow you to pay with a credit card (to earn rewards). Then, use those gift cards as debit cards to reload REDbird. See also: Best options for buying Visa and MasterCard gift cards. Can I reload other people’s REDbird cards? Yes. Most Target stores allow it, but there are a few stores here and there that check to make sure that you are the owner of the card. Avoid those stores, if possible. What are the reload limits? $1,000 per cashier swipe; $2,500 per day; and $5,000 per month. Are monthly limits based on calendar months or rolling 30 days? My reload failed. What’s the deal? Probably one of these: 1) Your REDcard has not been registered successfully online; or 2) You’ve reached your reload limit. Can I pay for the reload with an Amex gift card? Can I pay for the reload with a Visa or MasterCard gift card? Yes. Make sure to indicate that the form of payment is “debit”. NOTE: Some cashiers may be trained to not allow gift cards for payment. This varies by cashier and by store. Can I pay for the reload with a Target gift card? Is there a fee for the reload? They tried to charge me $3. What’s the deal? The system thought it was reloading the Amex for Target card. Ask the cashier to cancel and try again. Can I reload a subaccount card at Target? Should I reload odd amounts so as not to raise a flag with my credit card company? If it makes you feel better, go for it. Personally, I wouldn’t bother. Can I reload REDbird online with a credit card? Can I reload REDbird online with a Visa or MasterCard gift card? I successfully loaded a Visa gift card online as a debit card, so you are wrong. Am not. You got lucky. Don’t try it again or Amex will get angry. You won’t like them when they’re angry. Is there any way to reload online and get points, miles, or cash back? Maybe. If you find good options besides the trusty Suntrust Dellta debit card, please let me know. What do I have to do to get a 5% discount at Target? Simply pay with REDbird and the discount will happen automatically. Will I get 5% off gift cards? Yes, for some merchant gift cards (Disney gift cards, for example). You will not get a discount for Visa, MasterCard, or Amex gift cards. Can I reload one REDbird with another and get 5% off? Does REDbird offer a checkbook so that we can write our own checks? How do I use REDbird to pay ______ who only takes checks? Log in, select “bill pay”, add _______ as a biller, and pay them. They’ll get a check in the mail. Can I bill pay myself? Yes, but you might as well just link your bank account and withdraw funds to it. Can I bill pay the credit card that I used to buy gift cards? Can I move money from REDbird to my bank? Yes. Link a bank account and go for it. Won’t my account get shut down if I load REDbird and unload to my bank? Anything can happen, but I haven’t heard of any shutdowns with Bluebird or Serve due to this, so I believe that REDbird is safe too. Can I use REDbird as a debit card to buy money orders, pay taxes, etc? Can I withdraw money from an ATM? Yes, but only Allpoint ATMs. Can I send money from REDbird to Bluebird or to Serve? Yes. All three types of accounts can send money to each other. How much do ATM withdrawals cost? How much do reloads cost? There must be fees. What are they? The only fee is when buying a temporary card — some stores charge $5. There are literally no other fees. None. Nada. Zero. $0. What are the limits for ________? Does applying for REDcard lead to a hard credit inquiry? Can REDcard be enrolled in Amex Sync promos like Bluebird and Serve? How about Small Business Saturday? Does anybody have problem with using vanilla gift card to reload red card? my two local Target stores recently changed system and won’t allow me to reload redcard by using Vanilla Visa gift card. I was told I have to use either cash or named debit card. If you’ve already loaded with the new POS, please take a look at my post and if you see something that I missed, or if you had a different experience, let me know. Thank you. Thanks NoonRadar. Actually some of my local store clearly said I am not allowed to use third party gift card as debit card to reload. They said it is the Target policy. I do have luck to get reload in one Target by their new system.It seems different store handles differently. Vivian, when some stores decide to not let you load anymore, they often blame it on being a Target corporate policy, I’m guessing that way they don’t have to argue with customers about why did they just stop it now, etc. If that is the case, best to just move onto another store. NoonRadar, I did move onto another store. It is just getting harder to have my card reloaded.Three out of four stores won’t let me reload. They might have something circled inside the store. I might wait for a while to see if it is getting better. I do realize some employees don’t even know how to reload card. But there is Gift still on the top right corner.I was asked to hand the card to them. They told me I can’t use gift card as debit card to reload. But I feel like there would be less of a hassle if my name was on it. Just got one from Noonradar last night. Quick and easy to activate. Don’t know why I waited so long to get on the train. Guess I was just being lazy about canceling Bluebird. Now we’ll see how long the train lasts. Just bought one from NoonRadar too! I actually found his name on Million Mile Secrets and posted my review there but for some reason, it’s not showing. Anyway, got my card info via email almost immediately upon payment and my card is already registered. I don’t know if the fact I have a Amex cc made a difference but I was approve practically instantly. Everything was done within 1 hour.m! Thank you NoonRadar, I will definitely buy from you again if I need more cards for family members. Can the sub account holder get 5% discount? In one word yes. My wife has the main account and I am a sub-account and I receive the 5% discount. CP, I don’t have a subaccount myself to test it but it should get the 5% since I’m guessing for spending purposes it is no different and that discount feature should be hardcoded into the POS when you swipe Redbird; it shouldn’t care to distinguish for this purpose whether it is a sub account card or not. If you test it out, let us know though, for data points sake. My bank offers us a debit card that allows me to earn miles with a debit purchase. This was the primary way I was earning miles using RedBird as opposed to purchasing gift cards. Recently, they sent me a new debit card that has a security chip in it. The only change when using it at Target is that you now have to stick the debit card in the bottom of the POS terminal as opposed to swiping (similar to Walmart). I’ve tried 3x on separate days, separate times, and with three different CSRs but my debit transaction will no longer go through. I haven’t read anything here nor on other sites where a debit card with a security chip has can/can’t be accepted. Andrew, once the POS is upgraded at Target, chip cards can only be processed by inserting them. There’s essentially two ways these cards process, chip + signature or chip + pin. FI’d suggest you find out from the card issuer if you need to use a pin with it and try again. I haven’t used a chip + pin at Target yet, just chip + signature. @Andrew, is your bank a regional or a CU? The other possibility to consider is that it might just be a bad chip/card and needs to be replaced. At least I hope this is the case with one of my Citi chip cards that likewise doesn’t process at Target but doesn’t prompt me for a pin either. I ordered a replacement and when that comes in will give it a try. 2. It is a regional bank. 3. I don’t think it’s a faulty chip. I have used this new card at at least 10 other businesses (I.e. Starbucks, McDonalds, Walmart, etc). I’ve also had no issue withdrawing money from an ATM with this card. does the sub account holder also get to deposit an additional $5,000 or is it still $5,000 total on entire account? It’s $5K for the entire account, the subaccount is just a spending account, kind of like the auth user on a credit card. Target in Valley Stream NY – CSR didn’t know how to reload, she asked manager, he said we don’t do that no more, no one in NY do that no more. Was trying with VGC, CSR had me swipe redbird on user machine, when nothing came up is when she asked and I was denied. received an email from amex today asking to send them a copy of my drivers license and bank statement before allowing me to transfer berween bank and redbird account. i can move from redbird just not to redbird anyone else get one of these? Jason, I haven’t had this happen with Redbird (prob in part because I stay away from many such transactions) but I have had it with other fin institutions. I’m sure there’s people to whom this has happened with Serve, Bluebird or Redbird. In my case I complied to unfreeze the money, which they did. Yes it sounds a bit intrusive but they have the right to do such things nowadays. Keep in mind the banks motivations is usually to minimize risk of fraud/money laundering. It happened to me once somehow they had a glitch which they can’t transfer money to my bank which had been no problems before. I called them up and asked why and told them it is a hassle to response to their request. He agreed by letting me talking with the bank to verify my information. He first connected me to the wrong bank (I guess this was the main issue/problem). After that he connected to my bank and everything worked out OK. Tried a small $25 test in Florida, worked with no problem on a Visa debit gift card. Did it through customer service at target as I assumed they were more experienced cashiers. Sure enough, the young guy didn’t know how to do it and the older girl did. I told her about hitting K8 twice which she said was helpful to her. Current glitch is Winn Dixie is my best source of the debit gift cards, but they recently limited cards to $500 per purchase. Seeking a workaround or another source for the cards, but basically the system worked on a small scale. Steve, for more pin-gift cards try drug stores also in addition to grocery stores. As far as Winn Dixie, if they don’t swipe your driver license (and therefore don’t hard code the limits) you can prob go during a diff shift and at diff stores to get more. Cool, working on it. No they didn’t swipe the license so that’s a good idea, thank you. you are able to reload Serve cards with GCs? I was not aware of this, I thought they ended that. What kiosk and where? Stories like this are becoming more and more common. I think that people who are in this situation will have to switch to Serve or Bluebird like you plan to do if they can’t find any area Target stores that work for them. Had a couple of problems loading redbird from gift cards over the past few days. Yesterday, the cashier got a “transaction denied, please contact customer service for the card” type error. When I tried to pay with a different GC for the same transaction, same error. The kicker is that the transactions went through on the GC without money loaded to redbird. It took a call to AMEX to get the amounts debited back to my cards. Today, same error at a different location. This time I made sure the cashier voided the transaction and it looks like the amount was never debited. So far I’ve had 2 failed loads and 5 successful ones in September. Haven’t had any cashier ask to see the card yet. This happened to me recently on a $500 reload. I’m trying to work though the Target CSR lead that was on duty via their audit team. Are you saying just call the AMEX number on the back of my RedBird? What I do are they going to need? When this happened to me, I called the Amex number on the back of the redbird card. The agent was stumped since they were not having issues with loads on that particular day. After 20-30 minutes of her investigating and me being on hold, I asked if she could just call me back if they found a solution. She never did call, but I saw that the 2 debits were credited back to my GGs the next morning. The timestamps on the credits were from about the time I had called Amex. But you’re right, maybe it was the Target store itself that corrected the error. Like I said, the next time it happened to me I made sure to have the cashier void the transaction before I left. When she did that, I didn’t see the debit post to my GC. Next time this happens, just wait it out 24 hrs first. Most of the time people have/had errors loading a gift card to Redbird was on errors being caused on the gift card side, in which case the money usually goes back to the gift card within 24 hours. If after 24 hours you don’t see the money, then start calling. While my redcard continues to work, my wife’s got continual errors, call CSR. Afetr they gave up trying to fis it, they sent me a new card for, which also did not work. They said to cancel the card and apply for a new one. I got her an old serve blue card instead. I just tried to buy a Prepaid redcard and was told by Guest Services that they can’t sell the Target Prepaid redcard because trying complete the procedure crashes the machine. They said this problem was true in all stores. I got as far as scanning my Drivers License before it crashed. Any advice on what I’m doing wrong? They changed or software updated the terminals. At one Target near me, the guest services person told a different csr that only registers 1 and 10 can do the prepaids now. Obviously this may vary from location to location. Yes, the temporary Redbird issue is related to the POS update (permanent ones load fine). The registers that you mentioned in that particular store were probably left on purpose un-updated, that’s why they worked with no issues. But not all stores will have a register with the old software version and you won’t know either as to which one it is, they look the same from the outside. You can tell the version only once the process starts, due to some prompts being diff. Ironically, the vast majority of Target supervisors/managers have no clue about this (virtually all in my case). I’m positively impressed that they had figured it out at the store you went to. Just loaded $2500 in the Denver area. Went smooth like butter! Is it really true that you can’t use RedBirds in California?????????????? Lucia, except for in NC and AR, there’s no state-wide ban of Redbird. The vast majority of Target stores across the country let you load Redbird with gift cards (most even let you load a Redbird that is not in your name) but some don’t, per their own individual store policy which is reinforced by employees, not hard-codes onto their computers. If you want to share your city location, perhaps people in your area can help with data points whether they have been able to load Redbird recently or not. Thank you, NoonRadar. I’m in Oakland, CA. (near Berkeley and San Francisco) When I checked the Redbird site and the link to participating Target stores, California wasn’t listed as a state that had RedBirds available. Lucia, that is the link to the stores that have the temporary Redbird, it has no bearing on loading the permanent card. – The Target stores near me don’t have Redbird. Can I still load Redbird here? Whether a Target store offers the temporary Redbird card has no bearing on that store letting you load the permanent Redbird or not; their registers read it just the same. For instance most stores don’t carry it but they let you load it; the vast majority of Target stores across the country let you load Redbird. However, some Targets have made it a store policy to not let you load Redbird with gift cards, likely due to fraud concerns. The no-go stores are located usually—but not always—in densely populated cities, like NYC. Hi, my understanding was that the only way to get a permanent Redbird is first to get a temporary one. I also understood that one can only get a temporary one in a store not online. It also seemed that you can’t buy a temporary one in California. Am I totally off base?!?!! Lucia, the vast majority of people MS-ing bought their temporary Redbird online, since it is not available at most local Targets and it is not worth the cost of traveling far to get it (compared to buying it online). Basically the temporary Redbird is a mandatory token to register online for the permanent one, but you don’t have to have activated it yourself, you can register with the info of an activated temp Redbird regardless of who activated it. Others like myself provide the activated temporary Redbirds as a service, for a fee, in such situations. At NoonRadar.com you can purchase a temporary Redbird card instantly. You will also find there feedback comments (under Reviews) from many others who got it from me, including people frequenting this blog. Thanks, Noonradar. I’m on my way to check out! Thank you, Jason! I’ll check it out. Just loaded $1,800 of (staples) visa debit cards on my RedBird. The cashier did each card as a separate transaction so it took 10-15 minutes, but it went smoothly. Which location? I tried loading a Vanilla Visa today and the system prohibited it at both the Short Pump and the Staples Mill locations. Rats! West Broad st., Libbie shopping center. Do you use the same mailing address for all your RBs (or at least for more than one)? I have 3 with different addresses. I’m about to add my cousin as a 4th, but I’m considering skipping the step of mailing it to him and him sending it to me. I’m thinking just use his SS, and send to my address. Thoughts? You should register it under the person’s address, not yours. When you register it, Amex tries to match the information (name, dob, ssn, address) with public records (banks do this for checking accts also). If the records don’t match, Amex will make you answer questions about the records of that person, OR ask that you upload documents to verify the info, ID and a bank statement or utility bill. Therefore, do register it with that person’s address. Just recently there a couple of people who bought the temp Redbird from me and didn’t follow my directions to do so, their registration didn’t go anywhere, even after uploading the documents and asking Amex to manually correct their registration. Amex just told them to register again, and since you can only use a temp Redbird for one registration (whether successful or not) they’d have to buy/get another temp Redbird to register again. All: in-store REDbird debit loads have not been working today. We don’t yet know if this is a permanent change or a temporary glitch. Redbird does seem to be dead indeed. I wrote an article at NoonRadar.com (you can find it there on the Blog tab) pondering whether this is a temporary halt or not, I also put a picture of the error there. I got the picture with permission from one of the Target stores in which I attempted to load with a bank debit card. I sure hope I’m wrong though and that Redbird lives on. Regardless, I’m grateful that it lasted this long. Despite the Customer Service representatives best efforts, the system denied my ability to reload my Target Prepaid REDcard which loaded just fine last week. Dang it… Now I suppose that I will have to switch back to Serve and Walmart… until they pull the plug on that too. In the meantime, I HIGHLY recommend to all to REGISTER your Visa/MasterCard Gift Cards with the cards’ company’s website. This spring I kept putting off liquidating a Visa Gift Card and during this time someone guessed my cards numbers and was trying to buy stuff online. They registered the card in their name and everything. Registering the GC gives more security because its unlikely that someone can guess the card numbers and also your name or zip code. I ran into the same issues mentioned above. Oct 9th, loading redcard worked fine, no issues. I’ve gone to 3 different targets since and I’m now unable to load. I called customer service on the back of the card and they informed me that if a Target store has upgraded their system to the chip enabled technology, the old Redcards with the magnetic strip won’t work. I asked if this was permanent or temporary and was told that they plan to re-issue new Redcards with chip enabled technology which will allow you to load the card in person again. As of now, I believe it will be hit or miss at target locations depending on system upgrades and then its a waiting game until new cards are sent. Anyone else have a similar conversation with customer service? Ryan, Target has made it publicly known in the last couple of months that they intend to upgrade/replace their debit and credit REDcards to emv chip cards, they will be MasterCards. I had then asked Target and Amex abut when they might do the same with Redbird (prepaid REDcard), Amex was the one responding with an answer saying they didn’t know if and when that would happen for Redbird. Did you speak with Target or Amex (Redbird) cust service and did you clarify it was about the prepaid REDcard? I tried to call Target customer relations today about the news, you had no idea how many times I would specify I was referring to the prepaid REDcard which is different than debit and credit and it is a type of an account they have in cooperation with Amex, they kept asking me if my account was debit or credit REDcard. One the second rep finally understood (or so I thought) the line got disconnected; I didn’t bother calling back. The number I called was Prepaid redcard customer service. They asked several times if I was referring to another account and I continued to say “no, this is a prepaid redcard.” I was told that the prepaid cards will be upgraded as well but the person had no idea of a time frame. Interestingly enough, I also received an email from prepaid redcard that I needed to activate my card even though I already have an active card. I wonder if new cards may be coming sooner rather than later…. Sorry to break the bad news, but at least knowing for sure is better than the stress of uncertainty: As of October 13, 2015 Redbird is officially dead. Yes there is a Target memo and yes I saw it. Go to NoonRadar.com and click on Blog to read the details (you can also click on my handle here to get to my site). I’m not including the link to my post here simply because I know that posts with links require approval before they appear; I wanted to get the news out to end the Redbird MS-agony so to speak. Yeah, I don’t see Redbird rising from the ashes anytime soon. Wishful thinking, but I opened Serve accounts for both of us already. I don’t mind Walmart, at least they don’t play 20 questions like the nosy Target workers always do. As of October 28, you will not be able to link a new bank account to your Serve Account to add money. However, you will still be able to transfer money out of your Serve Account to a bank account. If you currently have a linked bank account, nothing will change – you’ll still be able to add money from that account. You can continue to easily add money through Direct Deposit, Debit Card, American Express Credit and Cash Reloads at thousands of locations. Now you can get access to your money up to two days faster* with Direct Deposit. You can automatically add all or part of your paycheck, government benefits and federal tax refunds to your American Express Serve Account. You can also review these changes in the Consumer User Agreement here. Notice the inclusion of “american express credit”, does that mean you can load with amex credit cards??? Yes, you can add an American Express card to your Serve account online and load $1000 per month, however you can only earn rewards on Amex cards that are issued by other banks. Hoping someone here can help. I had a bunch of One Vanilla cards left over when Redbird died that I’ve slowly been liquidating. Yesterday I attempted to purchase a MO at Meijer and the CSR received an error…customer must select a different form of payment. I completed the transaction with a different card, but now both cards have had their money deducted. I only received 1 MO. It seems the error is on the card end, and not with the merchant since the store was able to show me their transaction log with no evidence that they received the money. I called the 1-800 # on the back of the card and they show the transaction as completed. I was hoping the money would just re-appear on the card, but it’s now been 24 hours. They card issuer has sent me a dispute form to complete. My question: is completing the dispute form the way to go, or would calling the card issuer again be the way to go? It seems I have no further recourse with the merchant. Has anyone had this issue and had success after filing a dispute though the card? Thanks. At least with the Amex GCs a pending charge like that would take 8 full days to drop off. Maybe the same thing is going on with your cards. Thanks Ken. Unfortunately the transaction is not pending, but it’s showing up as completed. The card issuer said the same thing when I called. I did some searching and it seems this is a known issue with OV cards when they’re double swiped at the POS and selected as debit. This is what happened to me as the CSR thought the transaction didn’t go through the first time I swiped. At least one other person had success by filing a dispute with Incomm. I’m going to try that route. Still curious if anyone else has been successful in resolving this issue and what your approach was. Please let me know…Thank you in advance for your inputs. It is still alive & good for the 5% off Target and the other such standard benefits. I still use mine as such. It’s dead for manufactured spending, i.e. you can no longer load it at Target with credit cards or gift cards. Went to load cash at target today and was told it was no longer an option. Store mgr said he no longer had the option on the register to load anything on redbird. Will see on 1st if the website still allows debit load. Debit loads online have never changed since Redbird launched two years ago. Individual Target stores are a different story. They sometimes knowingly make their own restrictive policies. Often times though they’re just confused or ignorant about it, more so since Target got rid of debit/VGC loads a little over a year ago. Whether as a matter of policy or ignorance, once a Target supervisor or manager tells the cashier “no we don’t do that anymore” that is the end of it. Definitely, just getting harder and harder to use the card without direct deposit. I use mine every time I shop at Target or Target.com. I’ve linked it with the debit card of my main checking account and I don’t even load Prepaid REDcard in advance… when I use Redbird, it draws funds right away from my debit card (therefore checking account). So it’s as if I was using my debit card, but with the 5% discount & other Prepaid REDcard benefits like Chip-and-Pin and Amex purchase protection. I was intitally posting tho to get feedback as to whether as of October 15, 2016 any one else’s Target disallow cash loads. last year in Oct was “Cash is the only tender guests can use”, since Oct for me this year no cash either. I have target GC at my grocery so I’m 6% off purchasing that way and use redbird exclusively for billpay. Free ship and the other beneifts kick in with any amount spent so i just put the difference <$1 on the redbird when purchasing online. Just don't do much shopping at Target or .com anymore. Too much Amazon! I’ve seen reports online of both scenarios, some Target stores telling people no more loading at Target even with cash and some other Target stores still allowing cash loading. Personally, I never loaded it with cash and have no need to do so (except a couple of times when I was testing things last year) so don’t have any data points of my own.